Turn your Gold Cube into a highbanker! Take the hassle out of classifying and increase your yield at the same time! The 3/16th” punch plate allows for a 50% material size increase. There are nugget trap/drop riffles to instantly show the larger gold. 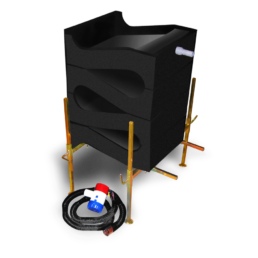 Simply attach the stand extensions to your existing Cube stand and attach the 5 foot hose (included) and you are ready to go for the gold! The Gold Banker can be used as a high banker/beach box configuration using the standard 1100 gph pump or optional 2000 gph pump. The Gold Banker works very well as a recirculating unit or can function as a stand alone classifier. The Gold Banker is constructed of thick ABS material with built in adjustable spray bar. The 3/16 punch plate is anodized or stainless steel and simply slides into the unit. 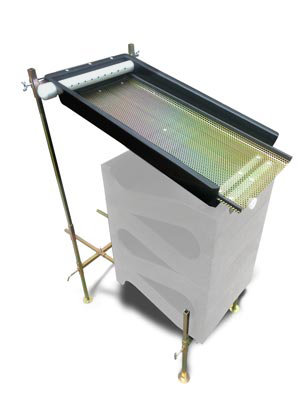 The stainless steel model is the best choice for salt water use.